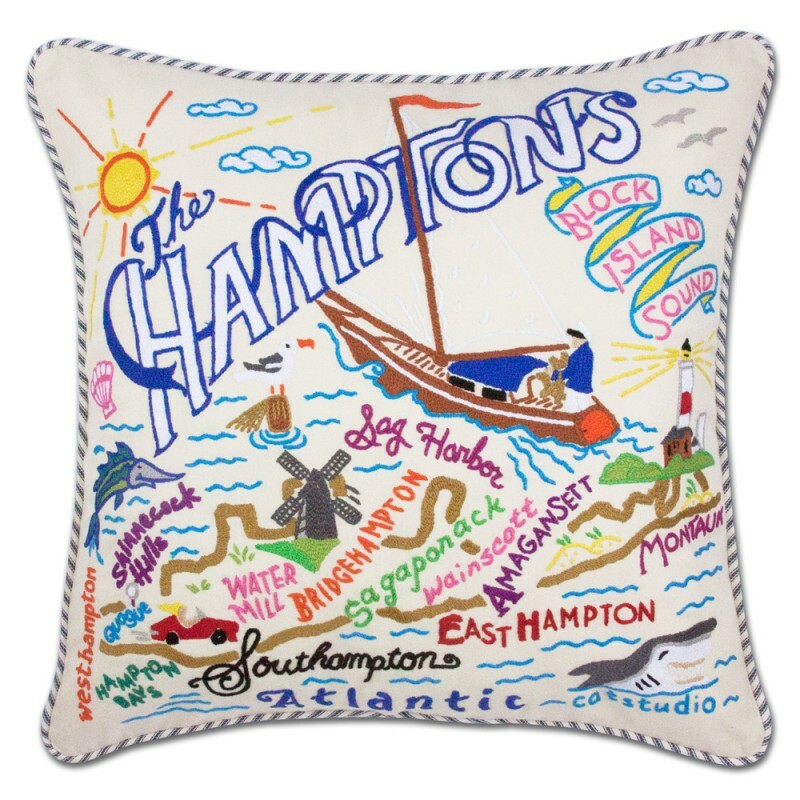 From Montauk to Westhampton Beach - this original design celebrates The Hamptons, New York in exquisite detail. This pillow is entirely HAND embroidered on light tea-colored 100% organic cotton. Amazingly it can take up to one week to embroider one pillow! It is also unique in nature since each artisan incorporates a certain flair and signature to his/her work. Accented with blue & white ticked piping. Each pillow takes about a week to create by HAND. Embroidery is done by experienced and talented artisans who are paid fairly and treated well. The art is embroidered on 100% organic cotton. As many as 30 colors of thread are used to create the rich and textural design. Plan for a minimum of four layers. Our favorite seasonal bedding wardrobe always contains the following basics: sheets, a blanket or matelassé coverlet, a duvet cover or quilt, and a throw. In the warmer months, you can fold down the top layers and sleep under the lighter ones, while in the winter, you can pull everything up for the ultimate sink-into-it comfort. Shake up proportions with differing lengths. If you opt for a quilt or duvet on top, try allowing a bit of blanket to peek out from underneath, or add a bed skirt for even more texture. If you have a bedspread that goes all the way down to the floor, focus on layering pillows, shams, and a throw on top. Contrast textures—lots of them. When you stick to a single color palette, you almost can’t go wrong with the type or number of layers. 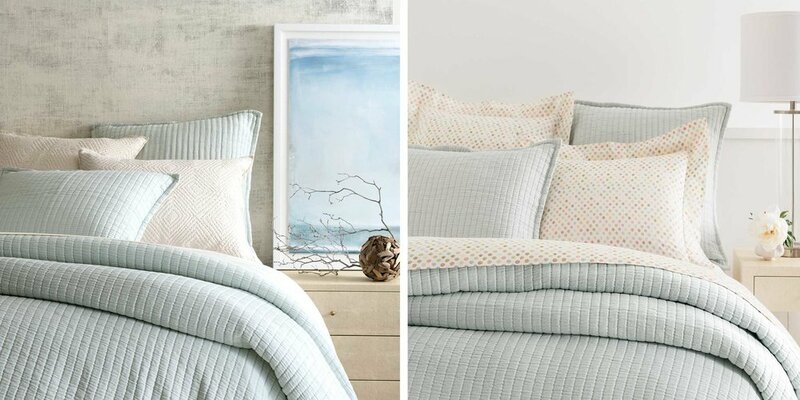 We love smooth cotton sheets paired with cozy fleece or chenille blankets, velvet or plush-textured quilts, lofty duvets, and nubby knit throws. Look for dressmaker details. You’ll be floored by how the smallest details can elevate the look of your entire bedroom. Smocking, ruching, pintucks, ruffles, buttons, appliqué, embroidery—all of these dressmaker details add depth, dimension, and character to a bed. Pile on the throw pillows, and shams. We usually opt for a minimum of three, following this general rule: choose at least one set of shams that matches your middle layer (matelassé coverlet or blanket) or bedcover (duvet, quilt, or bedspread), and add in two additional white decorative pillows or shams in either the same shade of white or a slightly different shade, and in complementary patterns/textures. If we could, we’d build ourselves a massive walk-in linen closet solely for stocking the shelves with a crazy-rainbow array of solid and patterned duvets, sheets, quilts, blankets, throws, and pillows, for switching up the look of our bed whenever the craving for color strikes. We’ll probably never possess such a magical place, so instead we’ve found ways to change the look of a handful of our favorite quilts and matelassés in the two simplest steps known to the decorating world: new shams and decorative pillows. We love this approach for many reasons, but mostly because it’s super-fast! Pop some pillows into their shams, toss on a throw pillow or two, and you’re done! It lets us experiment with new colors, patterns, and fabrics, while highlighting old favorites. And it’s affordable, allowing us to keep our décor fresh without changing out the most expensive pieces. Here’s a quick guide to giving your bed a new look with decorative pillows and shams. For an even more dramatic transformation, try adding an extra piece — a quilt, duvet, or throw — that coordinates with one of your new shams. Add a pop of color and pizazz to an otherwise beautiful bed by swapping out solid-colored pillow shams with pastel-hued patterned ones and maybe even the coordinating sheets if you want to create a cohesive look. This simple update packs a lot of character! For a touch of feminine flair, swap out solid ivory shams for ruffled white euro shams. What was previously a “buttoned-up” looking bed now looks positively dreamy with this super-quick change. In the place of solid white pillowcases, why not experiment with Blossom Pillow Shams? Who wouldn’t want just a touch of floral influence floating around? As the cherry on top, add in a colorful coordinating decorative pillow. Bring the design full-circle by adding in the Blossom Sheeting as well. Three quick swaps and voila! The perfect springtime bed! 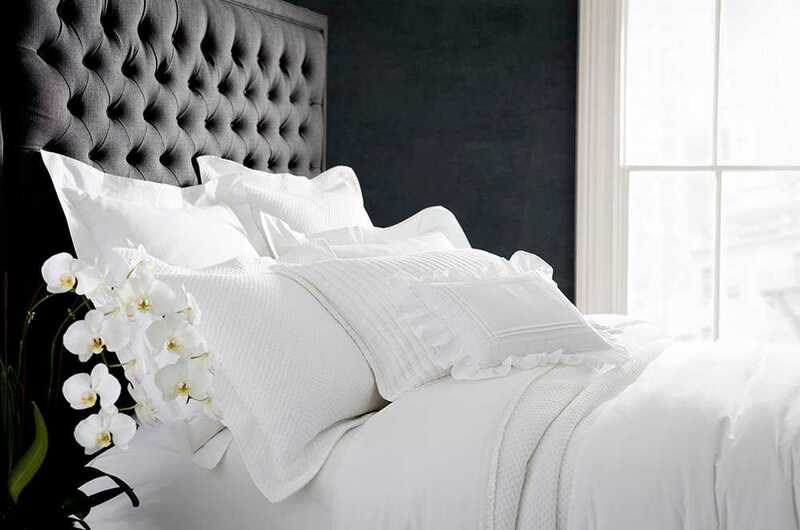 Keep your beloved pearly white sheets and bedding looking pristine with these 10 helpful tips! 1. No eating in bed! There’s no doubt your mother told you this time and time again growing up, but we’ll tell you again. You’re just asking for stains to happen! 2. Be sure to remove all make up from your face and neck before bed—this (should) go without saying, as it’s better for your skin, but it’s also better for your sheets! Skincare and make up products can stick to your bedding, resulting in an unsightly yellow hue. 3. If stains do happen (we know it’s hard to say no to breakfast in bed) be sure to treat the stain right away. The longer it sits, the more likely it is to set. Wet a sponge with warm water and a little dish detergent and gently blot the stain. Stain sprays also work wonders. Be sure to spray directly onto the stain and rub in the liquid with your fingers until most of the stain is lifted. If you can’t throw the item right into the wash, follow up by blotting the area with a cool, damp cloth to pick up any residual marks. 4. Step Away from the Bleach. Believe it or not, bleach can actually cause fabrics to yellow over time instead of whiten them. In lieu of bleach, reach for these common household items instead: Lemon juice, baking soda, and vinegar! 5. The Lemon Juice Method: Simply add ¼ cup of lemon juice to your load of whites right along with your detergent. The powerful citric acid will work on those tough stains during the wash cycle. 6. Using Baking Soda & Vinegar: These everyday items are both natural whiteners. Try adding half a cup of baking soda to your load along with your regular detergent. Then just before the rinse cycle, add half a cup of white vinegar to the load. Don’t worry, the vinegar smell will rinse away. We promise your sheets won’t come out smelling like pickles. PRO TIP: For even more brightening power, presoak your white bedding in a bathtub or large sink filled with warm water and ½ cup of vinegar. Let your whites soak in this mixture for up to an hour, then wash as normal. 7. Be sure to launder your linens regularly. When we sleep, an inevitable build-up of oils, dead skin, dirt and sweat occurs (gross but true). So, it’s important to wash them at least once every other week. Once a week is ideal if your schedule allows! 9. Try a Laundry Booster every couple of loads for an extra kick of whitening power. We recommend tried and true OxiClean or Borax. 10. Use a Mild Drying Method. Line drying is best, although we realize that’s not always the most realistic choice, especially if you’re experiencing the blustery, snowy winter that we are right now. Tumble drying linens on low is the second best option until the sunny spring and summer months of line drying outdoors becomes possible. Keeping your linens out of the dryer will keep whites from looking dingy and preserve the life of your linens overall. You can’t walk through the housewares section of a major department store without being bombarded by bedding signs trumpeting the virtue of high thread count—the number of threads per square inch—often with lofty price tags to match. While we’re all for purchasing the best bedding you can afford, our years in the biz have taught us a few things about thread count. Looks—and marketing departments—can be deceiving. When a single thread is made up of multiple strands or plies of fiber, some manufacturers will count each strand or ply to boost their total thread count. The dead giveaway is texture; if a sheet feels like something you might serve a barbecue on top of, we can guarantee it won’t become soft as a newborn lamb with a few weeks’ worth of washings. The quality of the fiber matters more than the actual thread count. The finest cottons, for example, have long fibers that create soft, strong threads that hold up to frequent washings. These sheets will feel softer and be more durable even at a lower thread count than inferior-quality fibers with an exaggerated thread count. If it seems too good to be true, it is. No matter how awesome your mom’s best friend’s bargain-hunting skills are, she won’t find a true 800-count sheet set for $50. Period. Expect the minimum. To get the most comfort and the longest wear out of your sheets, look for minimum thread counts in your favorite weaves. For a crisp cotton feel, go for a 200- to 300-count cotton percale. If you’re searching for sheets that are versatile and great for year-round use, 400-thread count sheets are less crisp and won’t collect pet hair! We can all agree that a little extra room in our linen closets would be wonderful, right? Towels, sheets and bedding get bunched and bulky on the shelves and sometimes it may be difficult to find what you’re searching for. One secret for saving space in your linen closet? Folding your fitted sheets as flat as your top sheets! Read on to learn how to perfect this (let’s face it) much-dreaded task. We promise, it’s so easy! 4. Smooth it down, and voilà! A folded fitted sheet that’s nicely flattened!